This chili is our go-to meal when the frozen tundra of winter hits Southern California (or when the calendar says it is winter, otherwise how would we know? Seriously, it is supposed to be 80 later this week). I have listed the ingredients for those of you without a Trader Joe’s. 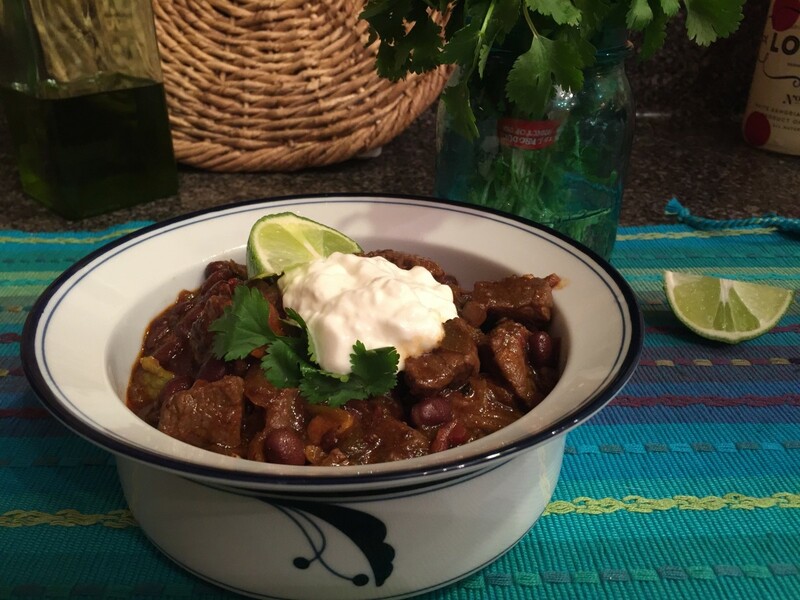 For those of you with a Trader Joe’s, we use their Cuban Style Black Beans (with green peppers and garlic), Diced and Fire Roasted Tomatoes (with green chiles), the canned or the frozen Hatch chiles; and last, but not least, Trader Joe’s frozen garlic cubes and frozen trio of peppers. It makes for such an easy recipe. As we were trying to watch football, I even had the butcher cube the meat, so I was able to put this recipe together in about 20 minutes and not miss much of the game. As I may have mentioned previously, we like it HOT! 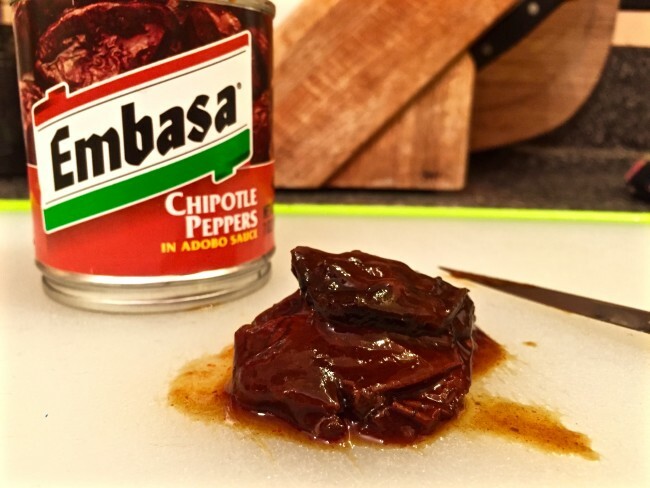 I used all the adobo sauce and about 6 chipotles for my recipe. I think if I had used the entire can, our heads would explode. So, in an abundance of caution, unless you like it really, really hot, only use 2 chipotles and a couple of tablespoons of the adobe sauce. If you love Hatch chiles, Melissa’s has a Hatch chile powder that is very good. They also sell Hatch chiles in season (August and part of September), fresh, frozen or even roasted. If you get the fresh chiles, BBQ them until the outside is lightly charred, let them sweat in a paper bag (makes the skins easier to remove) and then peel the skin off and freeze for use throughout the year. Since we were out of Melissa’s hatch chiles (we like the “hot” ones), I used Trader Joe’s frozen Hatch chiles, which I have only seen once, so I am not sure they will be a regular item. One last thing, we love, love, love the Lindberg-Snider Porterhouse & Roast Seasoning. I use it to season all of our meats. It is similar to Lawry’s seasonings if you can’t find it. Enjoy! Dry the steak with paper towels; cut into bite-sized pieces. Season with Lindberg-Snider seasoning and set aside to room temperature for about 15 minutes. Heat olive oil in 5 qt. Dutch oven over medium heat. Add beef in thirds to the pot to brown. Transfer beef to a large plate using a slotted spoon. Continue until the beef is browned. Add the onion, peppers, and garlic (add additional olive oil if necessary) and sauté until softened, about 5 minutes. Combine the chile powder, cumin, and cinnamon in a small saucepan over high heat until just fragrant (40 seconds) to release the flavors and then add to the onion mixture, stir and cook for 30 seconds to blend. 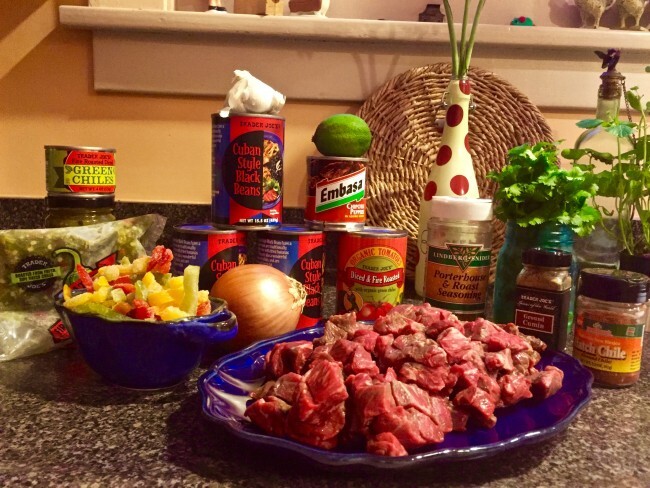 Add the black beans, tomatoes, the diced chipotles and as much of the adobo sauce to taste but at least 2 T., the green chiles and the beef including any juices to the pot. Simmer until heated through. Last but not least, stir in the lime juice and cilantro to finish. Suggested toppings: sour cream, spicy jack cheese or Cabot Hot Habanero Cheddar (buy at Vons or Safeway), diced avocados, more cilantro…. and don’t forget the cornbread!